Synthetic outdoor greens are becoming increasingly common as the costs of maintaining a grass playing surface continue to rise year on year. 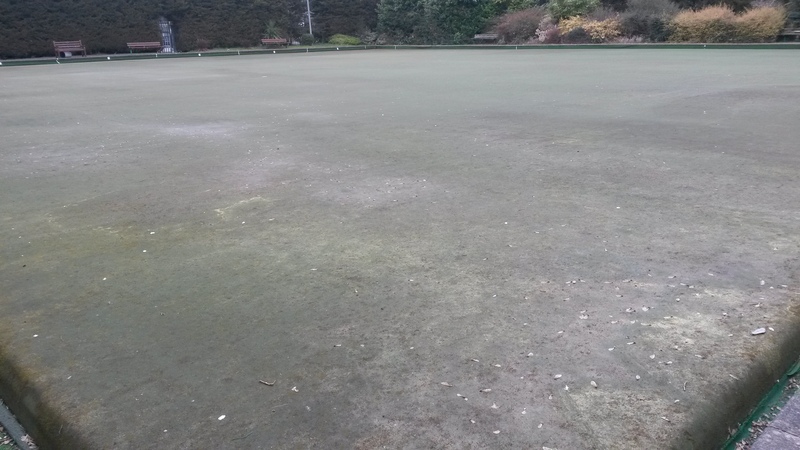 Many clubs therefore now see synthetic surfaces as the ideal way of lengthening the outdoor playing season and giving their club some sort of long term viability as membership numbers in the sport of bowls continues to slowly drop around the world. Typically maintenance in the past consisted of sweeping or blowing the green to remove surface debris and spraying the green on an annual or bi-annual basis with a moss killer. However synthetic greens need to be maintained much better if clubs wish to maximise the life expectancy of the playing surface and they need to adopt a regular cleaning regime where you vacuum the carpet at least once weekly especially during the summer and autumn months. Likewise moss killer certainly in the UK or Ireland should be applied twice yearly as an absolute minimum and if you are in an area that is prone to moisture and moss then three times a year would certainly be beneficial. All greens are subject to the harsh elements of the weather which depending on where you are in the world can be the sun, wind, rain, frost and snow or a combination of them all. The outdoor atmosphere at all times carries petro carbons, sand and dust; couple this with bird droppings, humidity and rain, it can quickly provide an ideal germination environment for the summer and autumn invasion of spores, pollen and seeds which get caught up in the fibrous nature of the artificial playing surface. If allowed to germinate many of the plants are hard to remove; moss in particular is almost impossible because the plant becomes intertwined within the carpet structure. It can of course be sprayed to kill any future growth but it is still almost impossible to remove without damage to the artificial surface itself. Build up of moss in a synthetic green slows the bowl down as it does on a grass surface and can affect the natural line of the bowl. It also looks unsightly but more importantly prematurely ages the synthetic surface and can bring forward the cost of replacement by several years. The best way to remove these seeds and spores so that you reduce the risk of germination is to vacuum them out of the carpet using a commercial vacuum cleaner such as a Proweave Sportsvac . This vacuum cleaner has been supplied to a number of outdoor bowling clubs throughout the bowls playing world and a full list of these can be seen by clicking on to the 'Existing Users' header and then either clicking on the file for either UK or Worldwide clubs. Outdoor synthetic greens tend to be laid on either a tarmacadam, concrete or the new type ‘dynamic base’ from Dales Sports which gives a greater degree of level accuracy, improved drainage, and does not suffer from contraction and expansion as a result of extreme ambient temperatures. With the ‘dynamic base’ greens we recommend that the Proweave vacuum be fitted with a front roller modification as the front castors on the standard model can leave lines on the green under certain conditions. If you would like to know more about this machine or a demonstration at your club so that you can compare your existing vacuum cleaner with the Proweave Sportsvac please do not hesitate in contacting me on 07785 361960 or via the demonstration link. This is what can happen to a synthetic outdoor green if no proper cleaning system is put in place......simply years of neglect have turned the carpet into an encrusted surface during dry weather and simply beyond any hope of a decent playing surface. This is what can happen to a synthetic outdoor green if no proper cleaning system is put in place.....simply years of neglect that create the encrusted surface in dry weather prevent drainage during wet weather and becomes an unplayable surface. 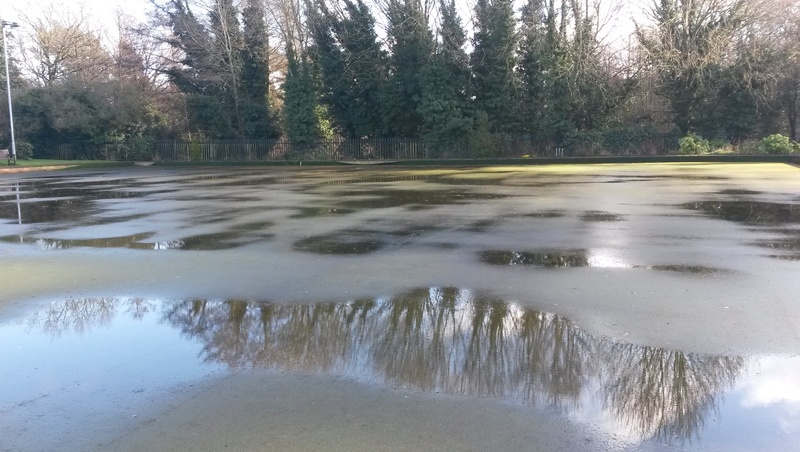 The picture taken at 2pm on a dry day shows the surface water still on the green form the previous days rain.